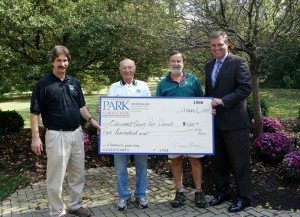 Chris Clingman, left, Director of Clermont Park District; Ken Stewart and David Anspach, board members; and Park National Bank Southwest President David Gooch. BATAVIA, Ohio (Oct. 16, 2014) – Thanks to a successful campaign to convert customers to electronic bank statements, Park National Bank, Southwest Ohio & Northern Kentucky, presented a check for $500 to Clermont County Park District on Oct. 2 at Pattison Park. The bank pledged to donate $1 for every customer who converted to electronic statements. The bank made donations to park districts in Butler County and Anderson Township as well as Clermont County. Any donation to the Clermont Park District, no matter its size, is a help, says Clingman. The Park District is funded by 0.1 mil property tax and fees charged for the use of some park facilities, such as the lodge at Pattison Park. Donations make up about 9% of the district’s current operating budget of approximately $550,000. The Park District does have a donation program for tree memorials and is putting one together for memorial benches. Any person or organization interested in making a donation to the Park District should contact Clingman at 513-732-2977. The Clermont County Park District operates Pattison Park, Sycamore Park, Hartman Log Cabin, Chilo Lock 34 Park, Shor Park, Crooked Run Nature Preserve, Kelley Nature Preserve, Wilson Nature Preserve, Williamsburg to Batavia Hike/Bike Trail and several greenspaces throughout Clermont County. You can find out more about the Park District at www.clermontparks.org.